Our Adult Day Program clients have been participating in a storytelling and art project with students from Huron county high schools. Marker in hand, a large sketch pad on the wall for taking notes, and a Reuben Sallows photograph in every storytellers’ hands – this is how the Huron County TimeSlips Storytelling and Art program emerged this summer. 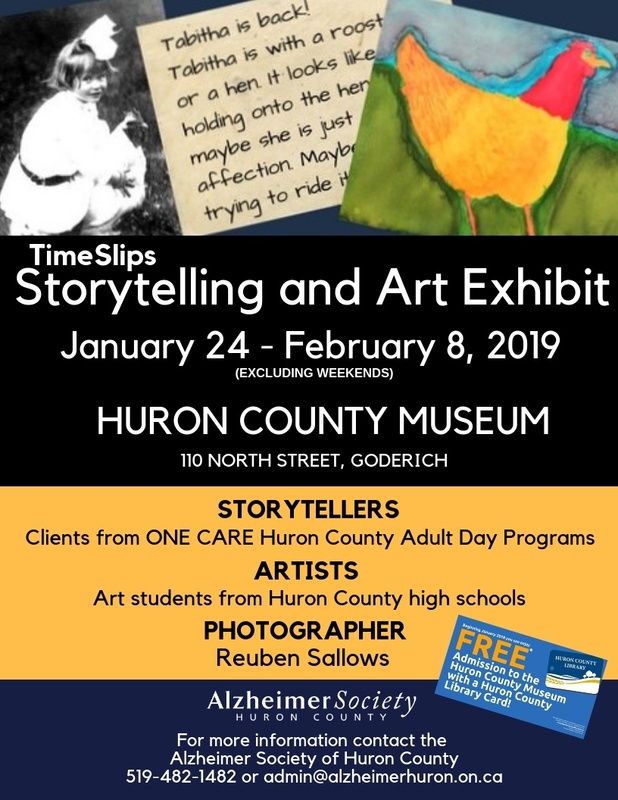 Spearheaded by the Alzheimer Society of Huron County, this intergenerational story and art exhibit features the collective work of storytellers, clients from five Adult Day Programs and student artists from all five area high schools. TimeSlips, a storytelling program originating from the University of Milwaukee, uses photographs to inspire people with middle or late stage dementia to participate in group storytelling. We started with historical photographs from Reuben Sallows, a Huron County photographer active during the turn of the 20th century. Our Storytellers, clients at Adult Day Programs, created the names, plots, and details of their stories based on those photographs. Our Huron County TimeSlips program includes a unique inter-generational twist. Our 15 stories have been brought to life through art work created by high school students across the county. When creating their illustrations, the students did not see the original Reuben Sallow’s portrait; their artwork is based solely on the Storytellers’ words. Seeing this program connect multiple generations through story and art has been an exciting final step in the Huron County TimeSlips Program. The “Huron County TimeSlips Storytelling and Art Project” exhibit features 15 Reuben Sallows portraits, 15 stories and 30+ pieces of original student artwork including watercolour, sketch, and video compositions. The exhibit will be on display from January 24 – February 8 at the Huron County Museum. (Closed on weekends.) Admission to the Huron County Museum is free with a Huron County Library Card.